A piece of a planet that survived the cataclysmic explosion of its star has been spotted orbiting the stellar corpse. This gives us a glimpse of what our solar system may look like when the sun dies. Christopher Manser at the University of Warwick in Coventry, UK, and his colleagues noticed something unusual when they were observing a white dwarf — the remnant of a star that has consumed all of its fuel — 400 light years away. 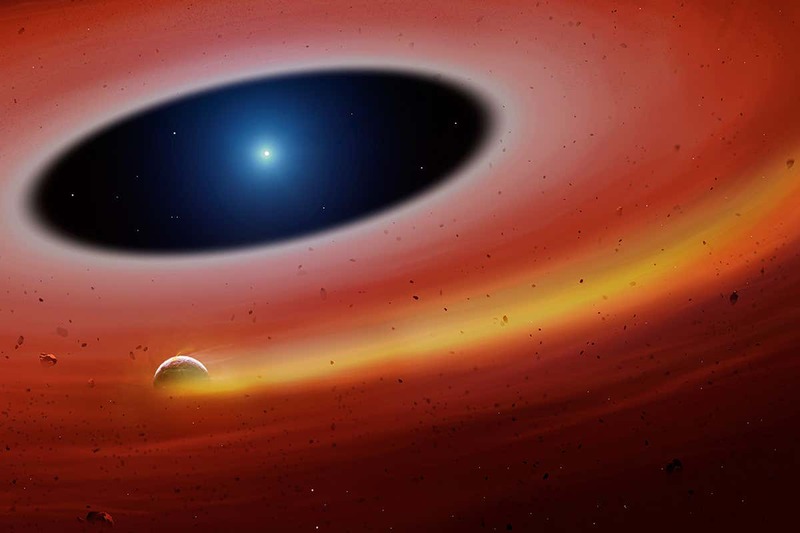 The team were looking at a dusty ring around the star thought to be formed from planets destroyed when the dying star exploded in a supernova. They detected a fluctuation in the wavelength of the light emitted by the dust. The signal repeated every two hours, suggesting there was a moving stream of gas in the ring, orbiting the white dwarf rapidly. Although the team is unable to see the source of the gas because it is small and faint, Manser says it is probably a solid object like an asteroid or a piece of a planet. It may have a radius of 400 kilometres, almost as big as that of Ceres, the largest asteroid in our solar system. It is probably producing gas as it sublimes or collides with dust particles as it whirls around the white dwarf. Moreover, the object is very close to the white dwarf because it completes a full orbit every two hours – if it was in the same orbit in our solar system, it would be inside the sun, Manser says. That means it must be very dense and perhaps made of iron or other heavy metals to prevent it from being torn apart by the white dwarf’s gravity, he says. “Most rocky planets in our galaxy are also composed of the same elements,” says Ben Zuckerman at the University of California, Los Angeles. So he suggests that planets in our solar system could share the same fate. It is thought that our sun will die in about five billion years, and Mercury, Venus and Earth will almost certainly be engulfed in the explosion, but Mars, which is further from the sun, may survive and continue to orbit the remains.